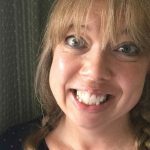 While I enjoy eating chocolate, after the festive season, unwrapping and eating another choccie, can, lose its appeal. And yes I realise that I’m probably in a minority here! 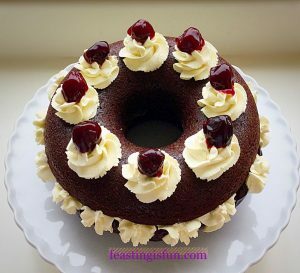 Since wasting chocolate is not an option that cannot even be considered, incorporating it into bakes and desserts seems the perfect answer. So, I present to you my Chocolate Hazelnut Baked Giant Doughnut. 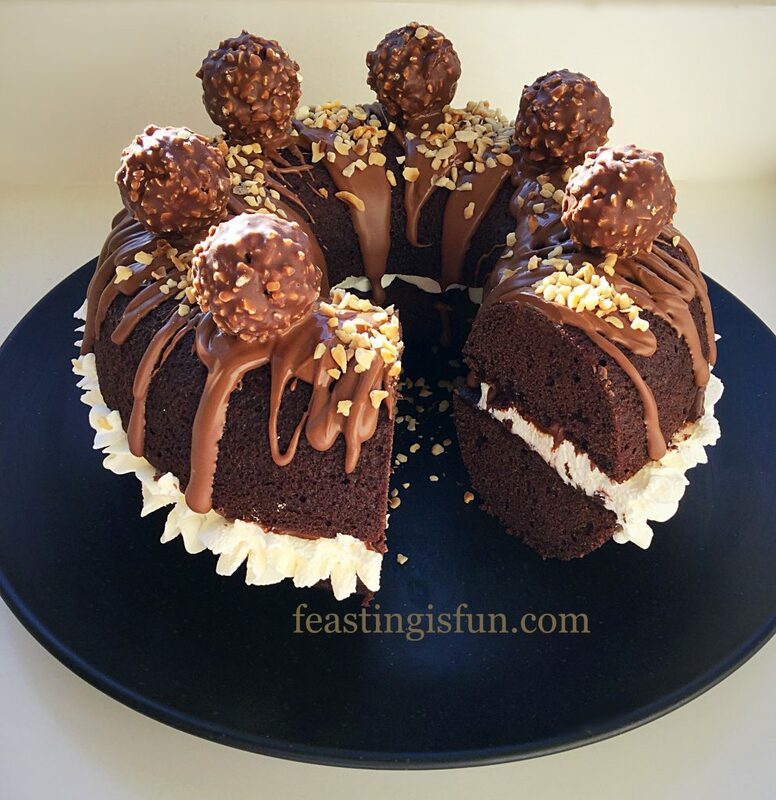 While using Fererro Rocher to top this bake, another Christmas chocolate was also used for the drizzling. Look away now if you love Teddy Bears. Because I used a whole Lindt Christmas jumper bear, melted down. Saying this is an indulgent bake, would be to understate. Serving this for dessert, will, without a doubt, bring about happy smiles and much excitement. 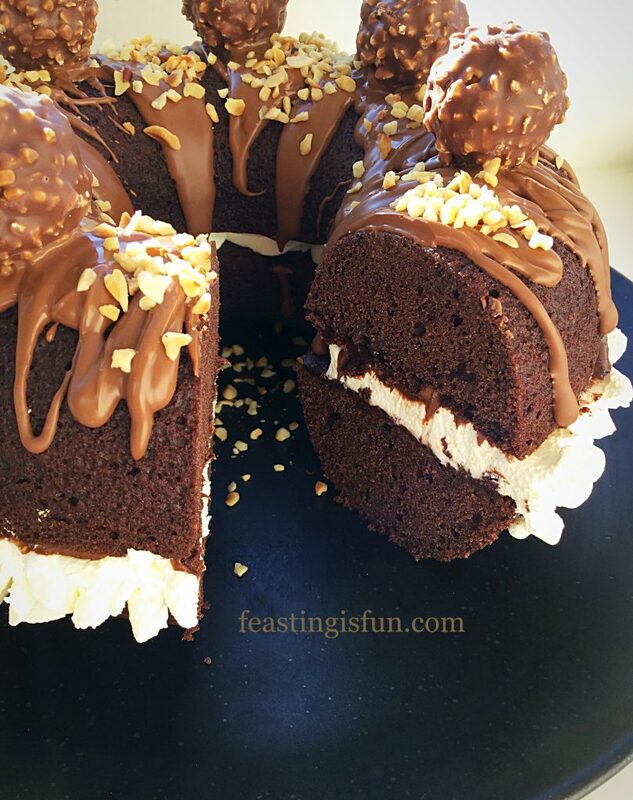 Chocolate Hazelnut Baked Giant Doughnut sandwiched together with whipped cream and chocolate hazelnut spread. 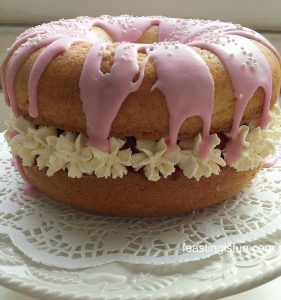 Creating a giant, baked doughnut, using silicone moulds, readily available online – mine were bought from Lakeland, makes an unusual and fun change from a sandwich cake. 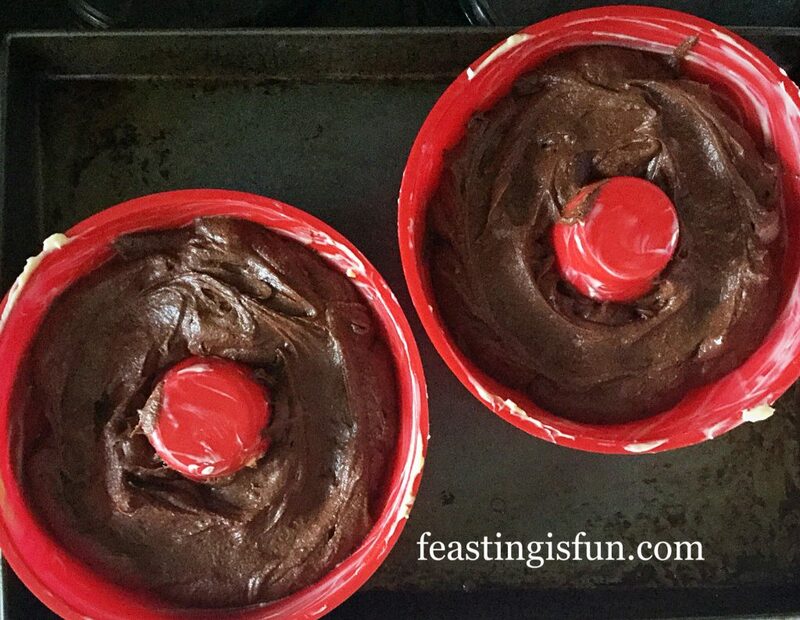 Alternatively, if you cannot source the moulds, this recipe can be baked in two, greased and lined 6 – 7 inch sandwich tins. Baking time will be approximately the same. 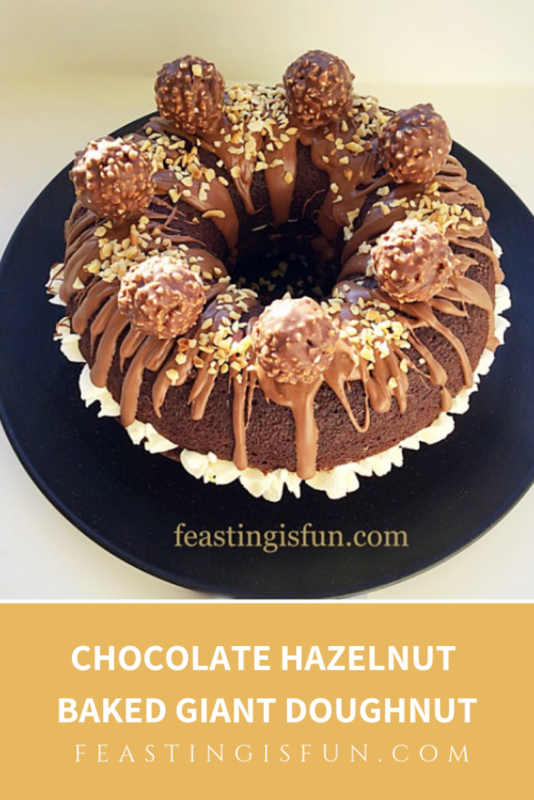 Chocolate Hazelnut Baked Giant Doughnut perfect for sharing. While a single, regular doughnut is perfect for one person, this giant doughnut is perfect for sharing. Since it is my belief that all food tastes better when it is shared, surely this can only be a good thing! First of all, grease the insides of the doughnut moulds with softened butter. Then place them on a baking tray, ensuring that they don’t touch. The silicone mould could easily be misshapen if pressed. To make the batter, start by placing the butter, salt and sugar into a large bowl. Whisk/beat together until pale and creamy. Next add all 6 eggs and the vanilla extract. Now sift the cocoa powder, plain flour and baking powder into the same bowl. Whisk/beat all the ingredients until they have just come together. Use a spatula to scrape down the sides of the bowl then give the batter a final mix. 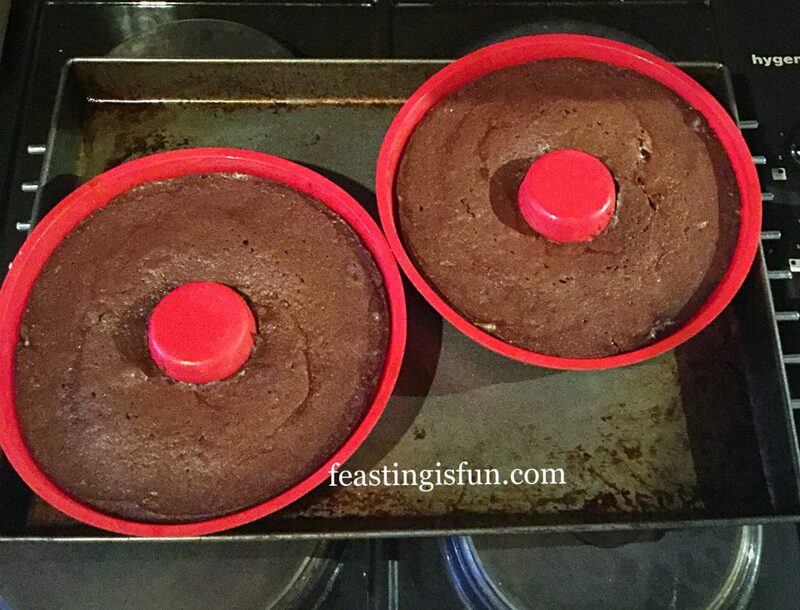 Divide the batter equally between the two moulds. Finish by smoothing the surface of the batter to ensure an even bake. Silicone giant doughnut moulds filled, ready for the oven. Place the baking tray, with the moulds on, into the centre of the oven and bake for 35-45 minutes. The sponge is baked when it feels firm to touch and springs back when lightly pressed. 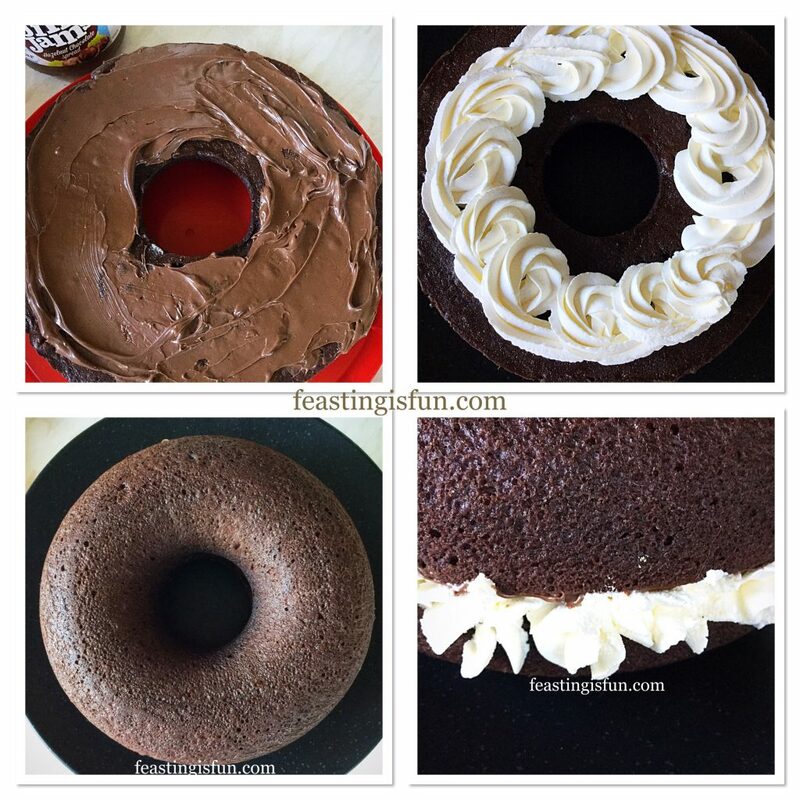 Chocolate Hazelnut Baked Giant Doughnut perfect flat tops from low and slow baking. Allow to cool for 5 minutes in the moulds and then turn the doughnut halves out on to a cooling rack. Cool completely before decorating. Since this doughnut was baked in the evening, it was stored, with baking parchment underneath and between, in an airtight container. Ready to be filled and decorated the next day. First of all, pour the double cream into a large bowl and whisk until it just starts to thicken. Continue whisking slowly until it just holds its shape. Take care not to over whisk so that it becomes stiff, this will make it difficult to pipe. Now take the half that is to be the top part of the doughnut and spread the chocolate and hazelnut spread evenly on to the flat underside. Place the bottom half of the doughnut, flat side up, on to the plate or stand on which it is to be served. Fill an icing bag fitted with a large star tip – I use Wilton #1M – with the whipped cream. Pipe a swirl pattern on to the bottom doughnut – as seen in the pictures. Alternatively you can spoon the cream on to the doughnut. Place the top half of the doughnut on to the bottom half. Pipe cream stars all around the centre, where the two halves meet. This creates a beautiful finish. Assembling the Chocolate Hazelnut Baked Giant Doughnut. Break or chop the chocolate into small pieces and place into a heatproof, microwaveable bowl. Zap in the microwave for 30 seconds at a time, stirring, between each heating. As soon as the chocolate starts to melt remove the bowl and continue stirring until the chocolate is liquid. Drizzle the chocolate, using a teaspoon, over the doughnut. 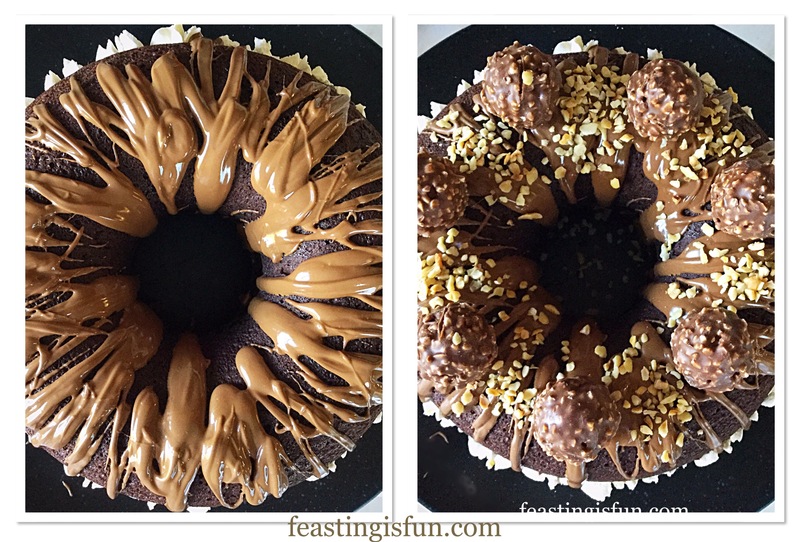 Next, working quickly before the chocolate sets, add the unwrapped Fererro Rocher to the top of the doughnut. Holding each one in place for a few seconds so that it sticks to the chocolate. Sprinkle over the toasted, chopped hazelnuts and allow the chocolate to fully set before serving. 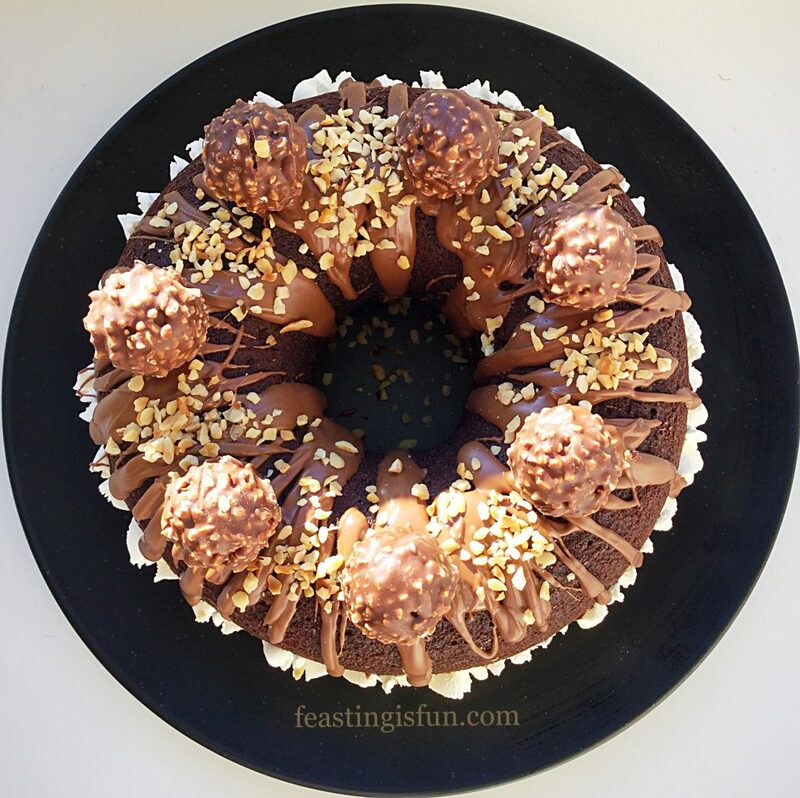 Warm, drizzled chocolate adorned with Fererro Rocher and toasted, chopped hazelnuts. 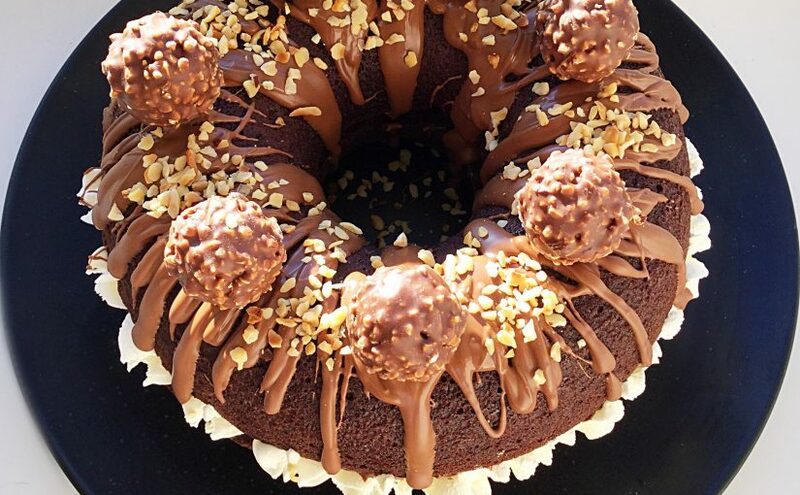 As soon as the chocolate is set this Chocolate Hazelnut Baked Giant Doughnut is ready to be served. Chocolate Hazelnut Baked Giant Doughnut so inviting. To serve, cut using a sharp knife, wiping the knife clean, between each cut, will keep the slices tidy. The sponge, whipped cream and chocolate hazelnut layers are clear to see. Store any leftovers in an airtight container in the fridge. While best on the day assembled, this doughnut will keep for up to 2 days. Strawberry Whipped Cream Giant Doughnut gluten free recipe option available. Since something as simple as a silicone giant doughnut mould can create such fun and show stopping desserts, I highly recommend them. 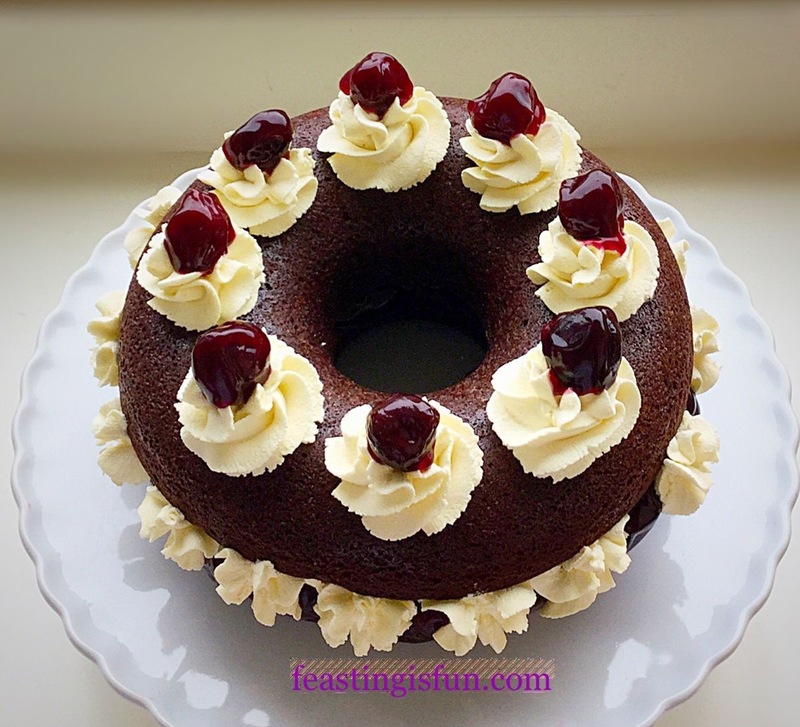 Most of all, if you serve up a Giant Doughnut as dessert to dinner guests, they are not only likely to be impressed, but also inquisitive about how it is made. 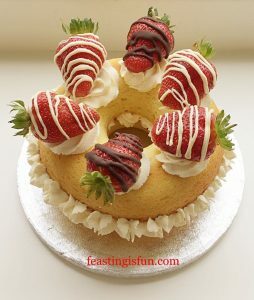 Baking should be fun, creative and adventurous. Best of all, it should be shared.